I blog on many different blogs, some of them mine. Each seems to be on it’s own time clock, including some of my blogs. For instance, I write for the Blog Herald and their time is set for the Philippines. On this blog, Lorelle on WordPress, the time was set for US East Coast Time as that was where I was living at the time I started it. On Taking Your Camera on the Road, until recently, the clock was still set for Israel time even though I moved from there three years ago. Okay, so I’m a little slow in keeping up with little details on my blog, but the timestamp on my blog posts really doesn’t matter much to me or my readers. The date, maybe, but if it was published at 4 AM or midnight, does it change anything? For some bloggers it does. Daniel Rowse, however, has posted on Monday. His exact time of posting? That’s right. He posted at 12:01, thus making that a post for Monday, not Sunday. I cannot accept his post as a sign of the Sundays. But, of course, there was a post on the 13th, which does qualify as the Sunday post for his blog. This, even though, I read it clearly on Saturday afternoon. Setting your blog’s clock can impact the future posts feature of WordPress. You might want to publish a day ahead, according to your clock, but your blog’s clock is set 24 hours off, which means the post will publish according to its clock, not yours. If the date and time are critical to your blog’s performance and WordPress Theme design, then make sure your blog’s clock is set right. For those to whom time and date on a blog post is critical, you need to set your blog’s clock to correlate with your date and time zone. It helps if you know how many hours your time zone is from GMT/UTC time. On your WordPress Administration Panels, go to Options > General. Scroll down to Date and Time. The current UTC time is shown. Don’t know your UTC time reference? WordPress will help, as will the table below. Under the Date format you will see Output. The date there is what the date would be if the clock was set right. Under the Time format you will see Output The time is what the time would be if the clock was set right. 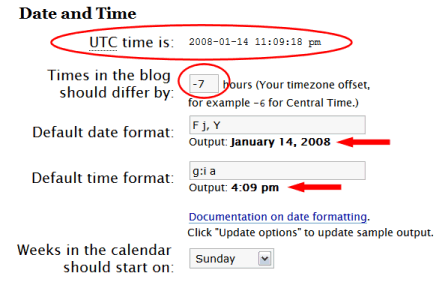 Adjust the hours under Times in the blog should differ by to the correct hours difference, plus or minus, from UTC to your time. Save the changes and when the panel reloads, check the Outputs to see if they match. If they don’t, add or subtract an hour from your UTC time accordingly. You can also set the starting day of the week on the calendar, if you use a calendar option on your blog. If you don’t like the way the times are displayed on your blog, preferring European or other date time form, see Formatting Date and Time in the WordPress Codex, the online manual for WordPress Users. WordPress doesn’t account for daylight savings time as the rules are so different around the world, so you have to manually change it in accordance with those rules for your time zone. Make a note on your calendar for the next daylight savings time change to change your blog’s time. The World Clock Time and Date, The World Time Server, and Time zone from the Wikipedia are helpful time zone references. This entry was written by Lorelle VanFossen and posted on January 22, 2008 at 4:35 am and filed under WordPress, WordPress Tips with tags how to use wordpress, wordpress, wordpress help, WordPress Tips, wordpress tutorials. Bookmark the permalink. Follow any comments here with the RSS feed for this post. Post a comment or leave a trackback: Trackback URL. Your blog’s clock wouldn’t be more than 23 hrs 45 minutes off due to time change (there are some weirdo time zones out there!) as then the actual day would be incorrect, not the time. Personally, I use a reader and don’t really concern myself on when people post. I also tend to post for my local readers versus my international readers. Recently, I added on the Fox Clocks into my browers with key times listed from cities where I tend to have participants or with whom I conduct business. Works out well, and since I have my clock set in my Word Press panel–I don’t worry about it much. What about the blog stats (“dashboard”). I find it maddening that the stats are in GMT, not EST (where I’ve set my blog). What gives? Good point. You would think that those would be monitored with WordPress template tags, too. Hmm. I don’t pay attention to stats so I didn’t notice. Might want to whine about that on the WordPress Ideas list. do you know the houe of madagascar please? The link you have to Geek’s End no longer works, as I changed the blog to jasonboom.com shortly after opening the doors. The post still exists, just with the http://www.jasonboom.com address. It’s all so much easier to calculate living in England, especially at this time of year when we’re on GMT. I can’t say as I’m too worried about the date and time of posts on my blog — the content isn’t especially time-sensitive. I don’t necessarily post every day; the main content is on a weekly schedule, so anything else is extras extras really. But I do appreciate that for some people it will be incredibly important to be able to say they broke a story first. I have recently been introduced to blogging and am hooked.However I need help in expanding my ideas and structuring the blog. Can someone help? I have also heard of people making money through Adsense, how does this work and can a wordpress.com blog host google adverts? how do you embed the code – where? As u can see I am still very green in this field. 1. When you set up wordpress it defaults to your time zone or GMT? 2. When you write several posts and schedule the posts, the posting clock is set to your default time or GMT? John Chow explained how he would write several posts and schedule them which I thought was a great way to stay on top of your blog. I’m trying to schedule my blogs to post at 6:30 AM EST without regard to daylight savings time. So my settings in my dashboards should be what? Then when I schedule a post, is my posting clock synchronized with my settings clock? Daylight savings time is something to worry about only once a year, so don’t worry about that, and one hour on or off isn’t a big deal. I’ve been using feature posts for years and love it. You’ve asked two questions. One, about how WordPress sets the clock. You set the time zone manually, compared to GMT. There is a link next to the time zone feature to help you calculate that number. You may have to play with it a bit if you are in a time zone sensitive area. The other is about future posts, which I adore. While the interface is different in the latest versions of WordPress, the instructions for using future posts can be found in Working Ahead – Future Posts with WordPress – in new versions you change it under the Publish Status Edit link. First, this article is not about putting a clock in your blog. Second, clocks in blogs only help you, not the reader, so reconsider adding one. hi,so you mean me only to ask about the post above right?i thought you know something and share something about clocks,ya i know that this article is not for putting clock.so sorry..for my comment.i will never comment you again.sorry sir….infact i havent commmented you but i have asked you for some help about clock coz iam new to wordpress. That’s an over reaction. In blogging, you ask about the post. For WordPress, you ask for help in the WordPress Support Forums, not just any blog that talks about WordPress or WordPress.com. That’s the etiquette. I wasn’t being mean, those are the answers I can give you. Because you are using WordPress.com, you are limited as to what you can put in the blog content area and the sidebar Widgets. There might be a clock but none I’ve heard of will work. Ask on the WordPress.com Forum for specific help on things like this. They are the source. hi bro thanks,thanks for the suggestion and i will do the same.i will keep writting thanks.As for reaction”iam highly reactive and follow the newtons third law fast then newton thought to ”so any way thanks bro. Actually, by default, the time clock (or stamp as we call it) is set by the server upon which WordPress is installed. A human must override it to make it match their timezone.